Born in North Yorkshire, David is widely regarded as one of the foremost dance accompanists in the UK. In a Career spanning over 25 years, he has worked with some of the finest and most respected teachers and choreographers of his generation. Based in his home County, David is currently engaged as both company and school accompanist with Northern Ballet Theatre, additionally for the Northern School of Contemporary dance, as well as the Royal School's Associate programme. David has worked with such international artisits as Darcey Bussell CBE and Jonathan Cope. An extensive list of leading teachers for whom he has played includes Deborah Bull CBE, Dame Beryl Grey, Gillian Lynne CBE, Marguerite Porter, Patricia Ruanne D. LITT. D.E., Marion Tait CBE, David Ashmole, David Bintley CBE, Sir Anthony Dowell CBE, Wayne Eagling, Christopher Gable CBE, Kevin Haigen, Niall McMahon, David Nixon OBE and Wayne Sleep OBE. He has accompanied the Royal Ballet, Birmingham Royal Ballet, Scottish Ballet, New Adventures, Rambart Dance Company, Phoenix Dance Theatre, New English Contemporary Ballet and the Mark Morris Dance Group. Additionally he has collaborated on education projects with The Royal Ballet, Birmingham Royal Ballet and Northern Ballet Theatre. Television credits include; A Master Class with Wayne Sleep (ITV), Men in Tights (Granada Television), Wonderland (BBC), and Dream Dancer (Sky). As a composer, David has written four full length ballet scores; The Little Matchstick Girl, Thumbelina, The Snow Queen and The Little Mermaid. He also composed the theme tune for A Master Class with Wayne Sleep (ITV). David's work with leading vocational centres includes Central School of Ballet, Elmhurst School for Dance, Liverpool Institute of Performing Arts, SLP College and Pinapple Dance Studios. He is a regular class and examination accompanist for the Royal Academy of Dance, Imperial Society and the British Ballet Organization and has played for regional and national courses for these respected bodies. for the past decade, he has accompanied the world renowned Yorkshire Ballet Seminars under the direction of David Gayle MBE and more recently Marguerite Porter. David is passionate in his interest for dance, for working with teachers, professional performers and aspiring students. He is delighted to now have the opportunity to release a series of ballet class CD's which capture and embellish his belief that ballet class can be fun, exciting and above all else artistically emotive. Dance your way into the real spirit of Christmas. David Plumpton features past hit tunes and current favorites, well-loved carols, fun songs and pop classics. 34 unrepeated piano melodies for a complete inter. Ballet class. 75 min. containing 35 unrepeated piano melodies in this mix of holiday carols. There are lots of wonderful upbeat melodies coupled with rich warm adagios. David's playing fills you with inspiration & makes you want to dance. At this season of thanksgiving and sharing, dance your way into the real spirit of Christmas. Filled with original and some familiar holiday songs. Christmas Is All Around, Once Upon A Christmas Song, O Come All Ye Faithful, & more. 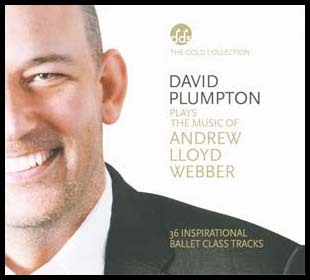 Inspirational Ballet Class Music by David Plumpton. It's a joy to dance to David's music! All selections are by modern day female artists from Madonna & Celine Dion to Adele & Lady Gaga. 78 min. 32 unrepeated melodies. David Plumpton offers a unique collection of familiar music that isn't on any other ballet class CD. 43 selections of unrepeated piano and string melodies. Music from the movie Beaches, Cheers, Muppet Show, Disney & more. 75 min.